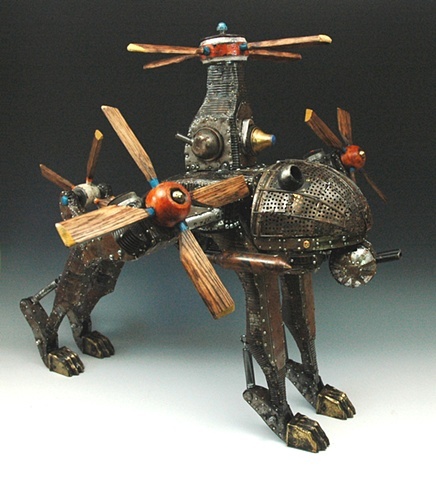 This piece is based in part on the Griffin-like sculptures of ancient Babylonian kings, dogs and the US Military's Vertical Takeoff and Landing (VTOL) craft the "Osprey". All the legs are spring loaded in the ankles, the engine nacelles rotate out and down to function vertical or horizontal flight. The cockpit, made of veggie steamers over a children's hockey mask features a working light. The body is covered with tin cans and feature a rust and burned patina. The feet are brass table leg covers in the shapes of clawed feet.